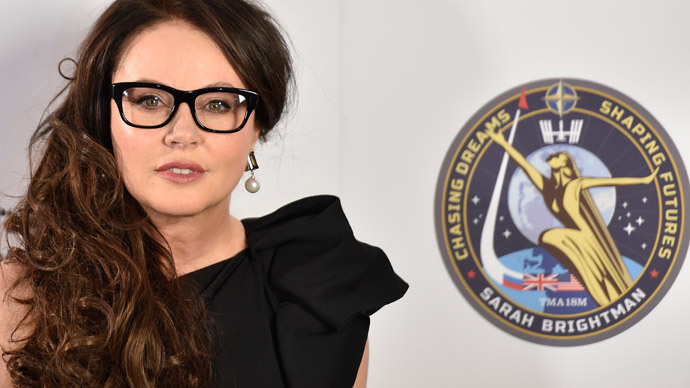 Phantom of the Opera star Sarah Brightman is undergoing training at Space City in Moscow while working on a song with her former husband Andrew Lloyd Webber, which she will perform on the International Space Station (ISS). The British soprano is due to blast off on a Soyuz spacecraft on September 1, and will spend 10 days on the ISS. Brightman, 54, told reporters at a press conference in London that going to space is something she dreamt about as a child in the 1960s. “We thought we were going to be astronauts. Even down to our serial packets there were things about space and what we were going to do. So for me to have got this far and to have got to be able to have a taste of what I felt at that time and to be part of the future is an amazing thing,” she said. Sarah is working with @OfficialALW on potential music to sing in space "Im trying to find a piece that is beautiful & simple in its message"
She did not give away much information about which songs she will be singing while stationed 420 kilometers above Earth. However, she did say that she and Andrew Lloyd Webber have started working on the music, and are trying to work out technical challenges. "To sing in microgravity is a very different thing to singing down here," she said. "We use the Earth to ground ourselves when we sing and the air around us. This is going to be very different. I'm trying to find a piece that is beautiful and simple in its message, as well as not complicated to sing." Brightman wants to connect with other musical talents on Earth – possibly a choir, another singer, or an orchestra. She explained that her training in Moscow is quite demanding, with a six o’clock start followed by lectures, four hours of Russian lessons, and survival and physical training. This includes undergoing practical and physical approaches to exercise, and skills in medicine and emergency operating procedures. She is thought to have paid around $51 million for the trip. The first space tourist was US entrepreneur Dennis Tito, who made his flight in 2001 for $20 million. The most recent tourist to the ISS was Cirque du Soleil co-founder Guy Laliberte, who paid $40 million for the trip in 2009. The only other woman to have taken a tourist ride into space was Iranian-born American engineer Anousheh Ansari, the co-founder and chairwoman of Prodea Systems. Her flight took place in 2006 and cost her $20 million.